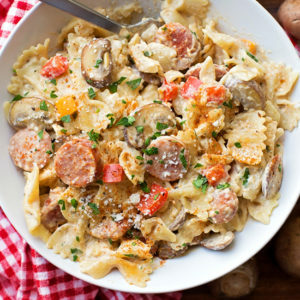 This one-pot cajun alfredo pasta is exploding with flavor!! It’s a quick, easy, effortless meal- all you need is 1 pot and 30 minutes. Whew. I don’t know about you, but lately I’ve been feeling completely worn out by 5 o’clock. Dinner is the very last thing I want to think about, let alone make. I can tell our kids feel the same. They’re fussy, needy and it’s just plain hard to prepare a meal when the kitchen is chaotic. I told you guys a while back that you’d be seeing more one-pot 30 minute meals, this is one of them! The ingredients are simple, the prep work is minimal, everything is made in ONE pot and you won’t be left with a messy kitchen & a sink full of dirty dishes!! ???? This cajun alfredo pasta was a complete lifesaver. I’ve had cajun-inspired pasta dishes a few times, but they were always a little more work, and I knew spending that much time prepping dinner wasn’t going to fly the other night. So I turned to the internet, did a little search and came up with a quick & simple solution: a one-pot alfredo. The process totally blew my mind. Not only was it crazy easy, but it thickened beautifully and tasted amazing. The best part? I didn’t have to make a roux. That’s right, there isn’t any butter or flour in this dish! 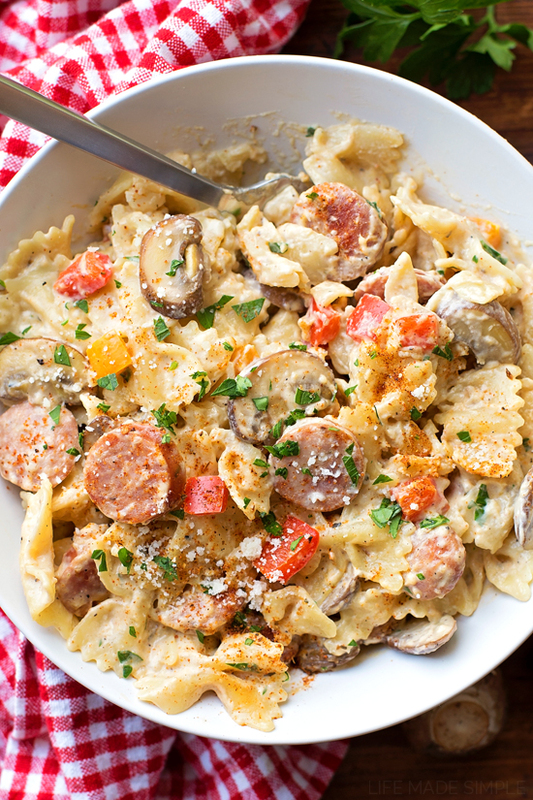 So gluten-free friends, grab your favorite gluten-free pasta and you’re good to go! Now, let’s talk about the protein in this dish. I chose sausage instead of chicken (although that would be just as good and you can totally do that too, same process) because I really wanted this dish to be flavorful, and different. We eat a TON of chicken and it’s nice to mix things up every once in a while. 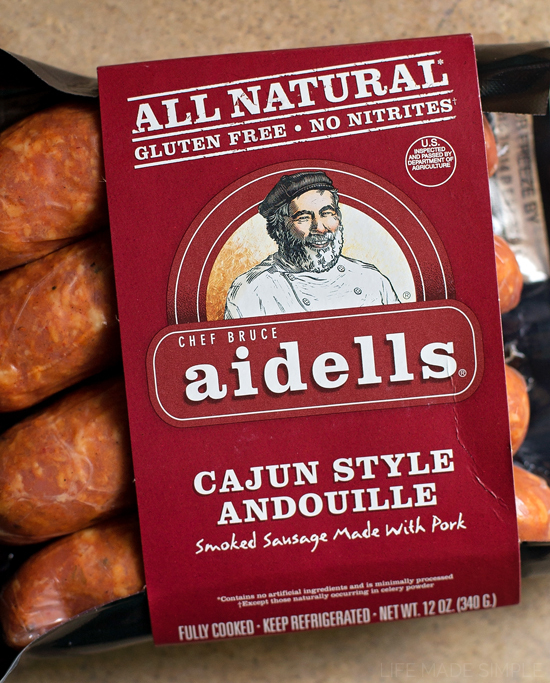 Aidells Cajun Style Andouille was the only andouille I could find near me so that’s what I used. This isn’t a sponsored post, I just love their sausage and had no idea they even made this kind! If you live in the south, or just happen to have a well-stocked meat department at your grocery store, feel free to use your favorite brand (or homemade). The process is really simple. Brown the sausage, then sauté the veggies, deglaze the pan with a little white wine (optional), add the chicken stock, seasonings and pasta, bring to a boil. Cook until the pasta is al dente and the sauce has thickened. Stir in a bit of extra broth and the parmesan and parsley, enjoy immediately. Our family loved this dish. It was filling and flavorful, but not overly spicy (good for our family with little kiddos, feel free to add more heat with a pinch or two of cayenne). This one-pot wonder will definitely be a part of our regular rotation! 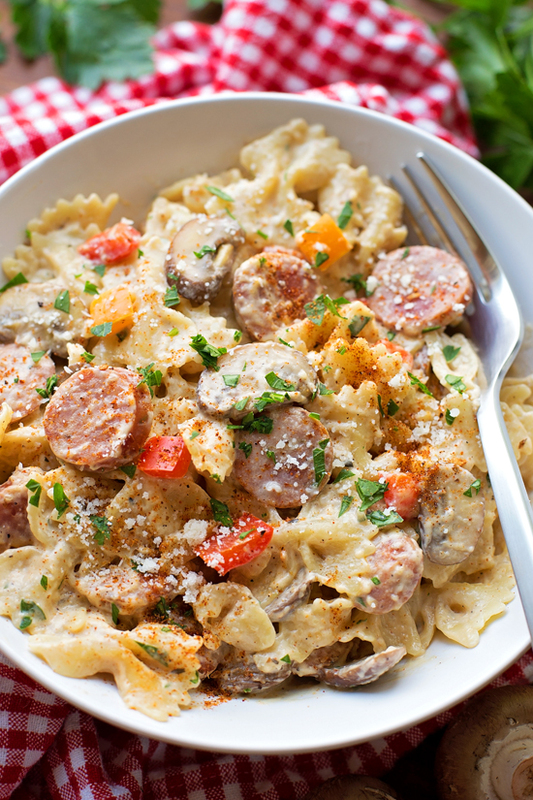 This one-pot cajun alfredo pasta is exploding with flavor!! It's a quick, easy, effortless meal! In a large pot over medium heat, add the sausage and cook until lightly browned on both sides. Add the olive oil. When the oil is hot, add the mushrooms and cook just until browned. Add the bell peppers and sauté until soft, then add the garlic and cook until fragrant (taking care not to brown). Pour in the wine and deglaze the pan. Using a firm spatula or whisk, remove any browned bits from the bottom of the pan. When the wine has reduced by half, add 3 cups of the chicken broth, half and half, cajun seasoning, salt, pepper, garlic powder and pasta. Turn the heat up to high and bring the mixture to a boil. Reduce heat to medium-high and allow the pasta boil in the sauce for 12-14 minutes or until al dente. The sauce should become thick and creamy. Add the remaining chicken broth to the pasta, stir to combine. Remove from the heat, stir in the parmesan and parsley. Serve immediately. *If possible, try using a seasoning with low sodium, or reduce salt to ½ teaspoon. I think adding a couple of handfuls of fresh spinach in the last minute would be good, too. Well, it’s 10 AM and I’m already ready for dinner after seeing this. 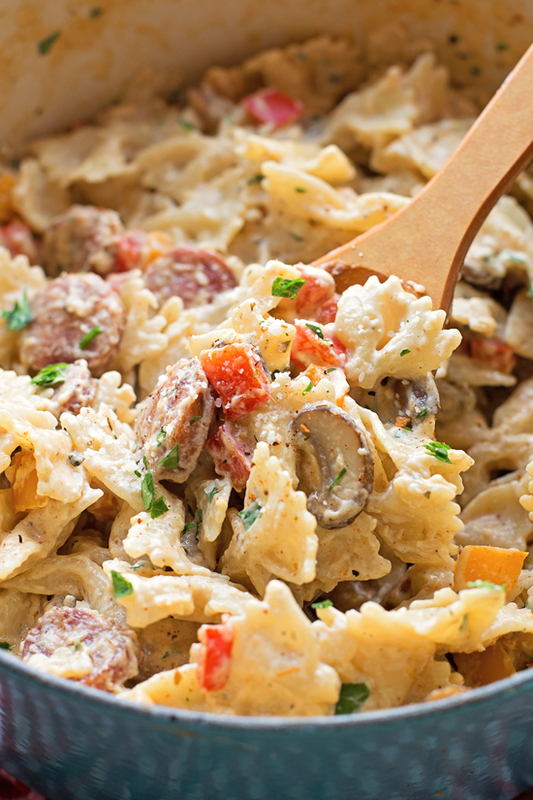 I love love love cajun pasta, and this is the perfect quick and easy way to do it! I’ve gotta try this one soon! My wife and I enjoyed your recipe very much. I think it will be a “regular” now in our recipes. It’s very flavorful. There is no cajun style sausage here in laredo, texas where i buy grocery. So i just used normal smoked sausage. Then I put a lot of “cajun seasoning” when I was browning the sausage and throughout the cooking, tasting every now and then until I thought it was good. The cajun seasoning I used is also just from a recipe I found on the internet, I can’t remember where. Maybe a dumb question but can you tell do you cook pasta before you add to mixture? Awesome dish! Family favorite. Cooked for Thanksgiving dinner & making a dish for Christmas party! Thanks Annie!! So happy to hear that you love it as much as we do! This was really good! 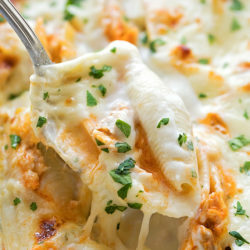 We loved it and will add it to our list of easy weeknight meals! The only thing I was careful about was adding salt. Lots of Cajun seasonings have so much salt in them, that extra may not be necessary. Thanks for an awesome recipe, I will be watching for more good ones. 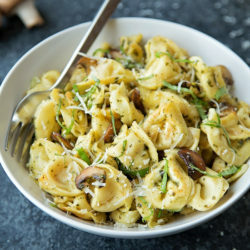 Would the half and half curdle if it’s on the heat long enough to cook the pasta? Love this recipe. Very easy to make. It is now a favorite. You know, we usually reheat it without any problems. I’d say the best thing to do would be not to overcook your pasta, and to add a splash of water or cream to the pasta when you reheat it. Hope that helps! For the info, if anyone doesn’t have cream, I made the recipe with about 5/6 full fat milk and 1/6 regular cream cheese. It turned out great. I would make it again anytime. I couldn’t add a rating in the comment reply so here it is! 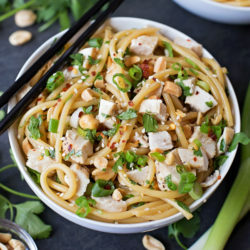 My husband, who loves spicy food, says this is his favorite dish I’ve ever cooked! We all absolutely loved it! Delicious! !